Scientists using the Cassini probe have found a new ring and one, possibly two, new objects orbiting Saturn. The discoveries are in the planet's contorted F-ring region, and look to be associated with Saturn's moon Atlas. University of London scientists working on the four-year mission say that confirmation of another moon would raise Saturn's tally to 34 satellites. The Cassini-Huygens mission is a joint venture of the US, European and Italian space agencies. The Cassini-Huygens mission is continuing to provide new discoveries at the Saturn system. A small object was discovered moving near the outside edge of the F-ring, interior to the orbit of Saturn's moon Pandora. 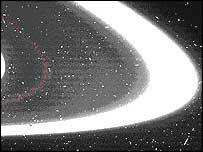 It was first seen by Professor Carl Murray, Cassini Imaging Team member at Queen Mary College, University of London, in images taken on 21 June 2004, just days before Cassini arrived at Saturn. "I noticed this barely detectable object skirting the outer part of the F-ring. It was an incredible privilege to be the first person to spot it." Murray's group at Queen Mary was the first to calculate an orbit for the object. Scientists cannot yet definitively say if it is a moon or a temporary "clump". If it is a moon, its diameter is estimated to be 4-5km (two to three miles) and it is located 1,000km (620 miles) from the F-ring, Saturn's outermost ring. It is at a distance of approximately 141,000km (86,000 miles) from the centre of Saturn and within 300km (190 miles) of the orbit of the moon Pandora. The object has been provisionally named S/2004 S3. Scientists are not sure if the new object is alone. This is because a search through other images that might capture the new object by Dr Joseph Spitale, a planetary scientist at the Space Science Institute in Boulder, Colorado, revealed something strange. "When I went to look for additional images of this object to refine its orbit, I found that about five hours after first being sighted, it seemed to be orbiting interior to the F-ring," said Spitale. "If this is the same object then it has an orbit that crosses the F-ring, which makes it a strange object." Because of the puzzling dynamical implications of having a body which crosses the ring, the inner object sighted by Spitale is presently considered a separate object with the temporary designation S/2004 S 4. In the process of examining the F-ring region, Murray also detected a previously unknown ring, designated S/2004 1R, associated with Saturn's moon Atlas. "We knew from Voyager missions of over 20 years ago that the region between the main rings and the F-ring was dusty but the role of the moons in this region was a mystery," said Murray. "It was while studying the F-ring in these images that I discovered the faint ring of material. My immediate hunch was that it might be associated with the orbit of one of Saturn's moons and after some calculation I identified Atlas as the prime suspect." The ring is located 138,000km (86,000 miles) from the centre of Saturn in the orbit of the moon Atlas, between the A-ring and the F-ring. The width of the ring is estimated at 300km (190 miles). It was first spotted in images taken after orbit insertion on 1 July 2004. There is no way of knowing yet if it extends all the way around the planet. Searches will continue for further detections of the new body or bodies seen in association with the F-ring. There are currently 33 confirmed satellites of Saturn. The new ring adds to the growing number of narrow ringlets in orbit around the planet.